The first fully functional high-quality audio mastering application for iPad. For everyone who wants to make their music even more excellent. 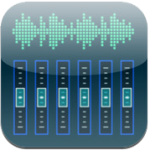 Based on professional sound processing algorithms this application turns your iPad into a real mastering studio. This all-in-one tool allows you to record and process sound, convert audio formats, change sample rate, convert bit depth, cut part of track for preview and make fade-in and fade-out. Support Audiobus lets to use it as Effects or Output together with other music applications. Moreover, with an external audio interface, you can use this application as a powerful sound processor or insert effect with your studio gears. Very easy and clear interface lets you tweak all controls in real time and listening to the final result right away. With built-in presets you can quickly find the general mood of your composition and a slightly tweak to get a best result. If you make own preset that you want to use later, you can save it as a preset hotkey. ● Support Dropbox service (you will need free Dropbox account). ● Updated Audiobus with fixed problems for new iOS. ● Updated audio clipboard feature for new iOS. ● Fully 24-bit audio processing algorithms. ● Linear phase 10-bands graphic Equalizer based on phase shifting. ● Three bands Stereo Imaging with common Stereo Width level. ● Harmonic Saturator with three sets of harmonics. ● Loudness Maximizer with adjustable response speed and ceiling. ● High-quality sample rate converter from 96, 88.2, 48 to 44.1 or 48 kHz. ● Bit depth converter supports 16, 24, 32 bits. ● Dithering with noise shaping. ● Solo mode for all Equalizer bands. ● Function Normalize at conversion of file. ● Support .wav, .aif, .mp3, .m4a, .caf .flac audio file formats. ● Predefined preset hotkeys, ability to create own presets. ● All processing settings are stored for each file. ● Processing group of selected files with predefined settings. ● Support Audiobus as Effect or Output. ● Recording from Audiobus Effect / Output or External input. ● Support Dropbox web service (you will need free Dropbox account). ● Sharing files on SoundCloud web service (you will need free SoundCloud account). ● Compatible with AudioCopy / AudioPaste. ● Support feature “Open in” audio file from other applications. ● Option “Open file in” sends file directly to another application. ● Access to files through internal Web service in local network. ● Support iTunes file share. iPad 2 and higher is strongly recommended (especially with Audiobus). Generally this application can be run with iPad 1 but there is possibility of dropping the signal out when playback at frequencies above 44.1 kHz or use Audiobus. Offline processing can be done with any iPads quite well. Please note: This application is audio processing tool only. It does not have audio editor functions.